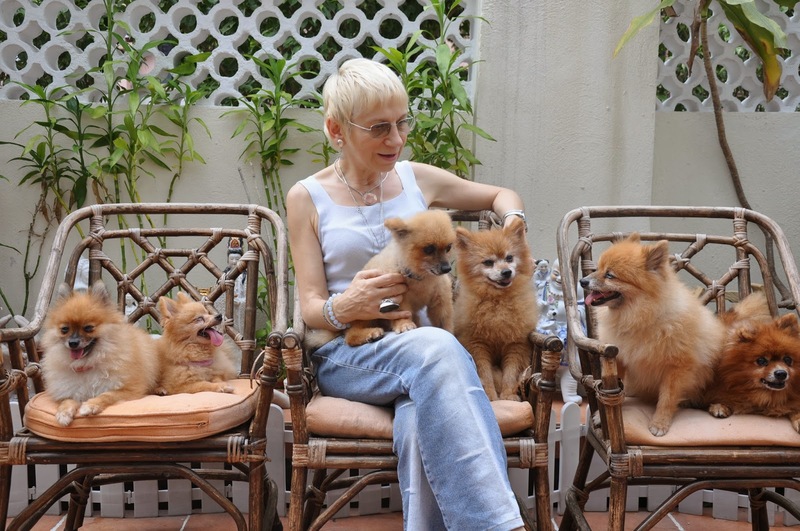 Rosina Maria Arquati is a very famous animal communicator both in Hong Kong and internationally. She was the first to teach animal communication openly in Hong Kong and now many animal communicators in Hong Kong are her students. Rosina has gained high prestige within the animal communication community. "Because I am talking to animals, the more you talk to them, the more you can’t eat them," said Rosina. She told me a story of one of her young female students. The girl was standing in front of a fish tank outside a restaurant and was talking with a fish. They became friends. She then entered the restaurant and when the meals were served, she realised that the fish lying on the plate was her newly made friend. Her fish friend’s sudden death and becoming human food made this little girl feel so shocked and sad for a long time. Like many internationally renowned animal communicators, Rosina is a vegan. Veganism is a more compassionate and respectful lifestyle for our animal friends. Being vegan means not eating any meat, eggs or milk, and not using any animal-related products, such as leather shoes, fur, animal hides, etc. Although Rosina is a vegan, she would not force others to eat a plant-based diet. She hopes humans change from their hearts and let their conscience decide which kind of diet to eat, then, such a change would be long-term. Therefore, Rosina encourages her new students to watch “Earthlings” and to make their own assessments. Earthlings is a documentary about society’s treatment of animals, unveiling the hidden truth behind the production of meat, fish, eggs, milk, leather and other animal products and how our human society is making a living from the exploitation and abuse of animal lives. She said that many of her students, after becoming animal communicators, gradually change to become vegetarian or vegan. Rosina thinks that a good animal communicator should not eat animals. If animals know you will not eat them, they will feel at ease while talking with you. In Rosina’s Mid- Level’s office, I was very curious to ask what her faith is. She said her grandfather was an Italian who immigrated to England, where she was born, and she has been a Catholic since childhood. Within the catholic faith, St Francis, some 800 years ago, is considered by many to have been an animal communicator. The stories of St Francis tell of him preaching to birds, making a pact with a wolf, and rescuing and healing injured animals. About 30 years ago, Rosina came to Hong Kong and came in contact with Asian culture for the first time. She likes Quan Yin Bodhisattva (Avalokiteśvara) very much. She describes her faith as “fusion”. She has been to Mount Putuo, and she goes to churches and temples. In Rosina's eyes, the eastern Quan Yin Bodhisattva and the western Saint Francis are the representatives of great compassion and loving power, regardless of race and species. Animal communication refers to the art of communication with animals without the need of spoken language. Animal communication uses telepathy to communicate with animals directly, sending and receiving messages through the heart and mind in forms of images, sensations, feelings, smells, intuition and dialogue. Some animal communicators are born with this ability, while others can be trained. Rosina is a natural telepathic animal communicator. Since the age of five, she has been able to communicate with animals. She said animals are sentient beings of love, feelings, emotions and thoughts. The main difference between animals and humans is the outside appearance. Many people think that animals have no soul. “This is not true, animals do have souls inasmuch as humans have souls,” said Rosina. When Rosina is communicating with animals, the animal companions will project their feelings, emotions and thoughts to her, so that she is fully aware of their happiness or sadness. Rosina's husband is a veterinary surgeon. I asked Rosina how her scientific and logical minded husband views her telepathic communication. Rosina said that although he is a very academic person, he is also very open-minded. Being a doctor for so many years, he has seen a lot of medical miracles. He knows there are some things in the world which scientific theory cannot yet explain. Because her husband is a vet, Rosina can interact with many different kinds of animals. In some special cases, she may communicate with sick animals to help a vet get more information to find the proper treatment. She added that scientists are studying the ways in which animals communicate, but these are still early days in such studies, with so many different species of animals to try to understand. But she is also very optimistic to say that science is progressing, and our learning continues. She said that if 50 years ago she had told her grandmother about the iPhone, she might have been regarded as ridiculous. But now even children may feel the iPhone is a very common everyday item. The minds of humans have become complicated as a result of the ways in which human society has developed. Humans worry about past, present and future, especially worrying about the future. Animals do have memories, and learn from the past. But animals seem to focus more on the present, keeping thoughts simpler, and so the natural quality of animals tends to be more free and relaxed. In contrast, humans often harbour negative memories of past experiences, and allow these to affect their worrying about the future. Animals do not necessarily fear natural death. However, they do fear being slaughtered by humans. This sense of fear brings a lot of pain to them daily, and their bodies are filled with distress, fear and anger. The factory farming of animals produces a lot of methane gas, contributing to global warming and climate change, and in turn climate conditions are becoming more and more unstable. Animal waste from factory farms pollutes land, air, underground water, rivers, oceans, a lot of which have become dead zones. I asked Rosina how the current environmental situation affects wildlife. She said that wild animals are struggling to survive with no homes (loss of habitat), loss of natural food sources, fewer places to shelter, fewer and fewer trees. Rosina stressed that factory farming of animals is the cruelest industry in the world, followed by the fishing industry and then experimentation on animals. The reason the fishing industry is so cruel is because the fish suffer when caught in the nets and when the fishing nets are hauled out of the water, thousands of fish will suffer, struggling and suffocating to death, while even under the water marine mammals, turtles and other creatures can drown slowly when caught in the nets. After animals are slaughtered, all the fear, anger, pain and negative energy will stay in their dead bodies. If humans eat this meat (including。 fish), their health, thoughts and emotions will be negatively affected. Rosina said she cannot go near the cold section at the supermarket, where the meats are full of heavy and negative energy, because it makes her feel very uncomfortable. Also, she cannot go to the meat and fish markets, because she once heard fish screaming for help there. Rosina has a wish that she can see a vegan world within her life span. She said, “Animals know you, more than you know yourselves.” Then she told me a story about a cat. Rosina said that cats are sometimes difficult to communicate with and that some cats feel important and may speak bluntly. Rosina first met her husband-to-be at the UK Vegetarian Society. One time, before they were married, she went to visit his home. Her future husband had a cat and the cat knew that Rosina could talk with her. While he was away for a moment, the cat argued with Rosina and talked to Rosina about him. Later, her husband-to-be came back and she told him what had happened. He wondered why his cat knew so much about him! Rosina is a supporter of animal welfare. All her pet dogs are rescued from animal shelters and she would never buy a pet. She named the dogs after precious stones, giving each dog a noble name. Giving animals a good name is very important, as they will feel respected and regain confidence. In addition, a good name will bring them good energy. In the interview I brought up the topic of neutering male dogs by saying “Many people say that to desex a male dog will make him very upset.” She replied that, in our present state of science and options, desexing dogs is still necessary because, without this, so many dogs will be produced as new puppies which will suffer and eventually die or be killed. The dog itself does not mind, but in some cases it’s just the dog’s male owner that would mind it! In order to rationalise the eating of meat, our human society classifies some species such as cattle, sheep, pigs, chickens, etc. as food animals while, because of personal preferences, cats, dogs and other species are classified as pets, not food. The term for this is ‘speciesism.’ Rosina feels that it is unreasonable and unfair to say that some species should not be eaten while others should be. Horses can be pets but some people eat horse meat. In addition, many people keep pet fish, and some keep pet pigs, sheep, cows and chickens. Rosina stressed that species are different merely in external forms, but that they are all sentient and can suffer. She very much hopes that human consciousness can be raised to a point where animals are no longer eaten, and where we no longer make a distinction between animals that are to be eaten and those that aren’t.